I will admit there was some trepidation as I sat down to see Redfox 3 Theatre Company's production of Susan Hill's much loved ghost story The Woman In Black. It was not due to the anticipated horror of the novella-turned-play, but the hopes that the newly established company would be able to tell the tale just as masterfully as it has been told in the West End for over three decades. I remember seeing Stephen Mallatratt's adaptation of the play for the first time in 2008, and feeling something I have never felt in theatre before; terror and fear. A genuine emotion of unease rippled throughout the audience and the walk home that evening was not a joyous experience. This experience repeated itself upon my second, third and fourth viewing of the play, and it's fair to say that The Woman In Black is my favourite theatrical performance of all-time. Fortunately, in this local production, director Justin Stephens has maintained the overall apprehension and dread that slowly builds into the story, while also creating some original moments that even had me surprised how certain events were executed. His direction of the woman in black ensures there are palpable "jump in your seat" moments and the relationship he creates between Kieran Tracey and Chris McLean's characters feels highly authentic. Tracey's switches from the Actor to the younger Arthur Kipps are well defined and he manages to keep the two characters distinct in mannerism and speech. As the story develops and the mystery deepens, Tracey expertly shows how both these men begin to be haunted by their experiences. McLean delivers a convincing effort as present day Arthur Kipps, however I felt there needed to be a stronger weariness and alertness to him considering all he has endured. McLean's portrayal of the various townspeople and minor characters were too often played for laughs rather than attempting to keep the serious nature of the story, though this is more a comment on the direction than McLean's acting. Set designer Merinda Backway's clever use of the space and darkness allows the audience to run off with their imagination. Lighting - or lack of - is imperative to a show like this and lighting designer Callum Robertson does an impeccable job in literally keeping the audience in pitch dark while being able to see the actors on stage. Unfortunately, the use of the projections in Act 1 felt very much out of place with the rest of the performance and their use seemed to be more to manipulate the audience into feeling scared rather then letting us feel the terror organically. Considering they are never to be seen again in Act 2, perhaps it would even be better to leave them out completely. 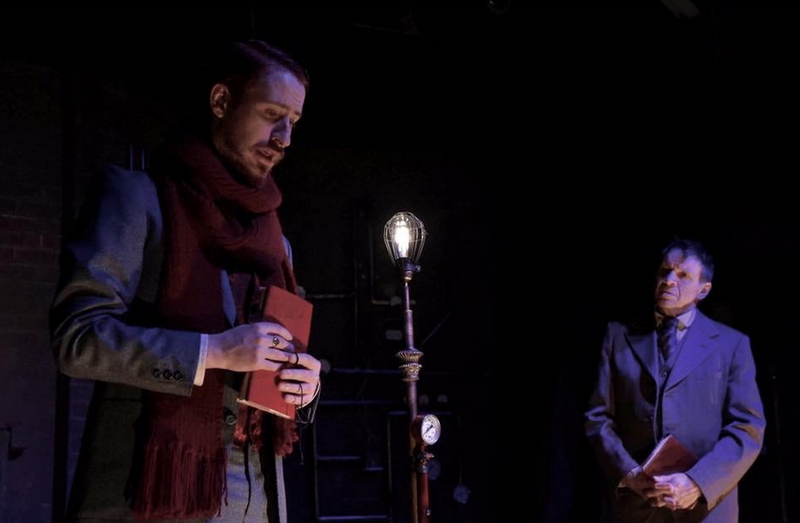 Despite the mentioned issues, Redfox 3 Theatre Company has taken on an ambitious gamble of staging this classic book, and this production of The Woman In Black pays off handsomely. This conventional yet highly entertaining ghost story is full of chills and thrills that is bound to have people sleeping with their lights on. *Original review appeared on Theatre Press on 30 August 2016.